This lovely apartment to rent in the sea front complex of Costamar in Los Cristianos enjoys on of the best location in the resort. It also has a large sunny balcony with wonderful views. Being set in the highly sought after complex of Costamar, this high quality privately owned 1 bed apartment enjoys one of the best locations in Los Cristianos. 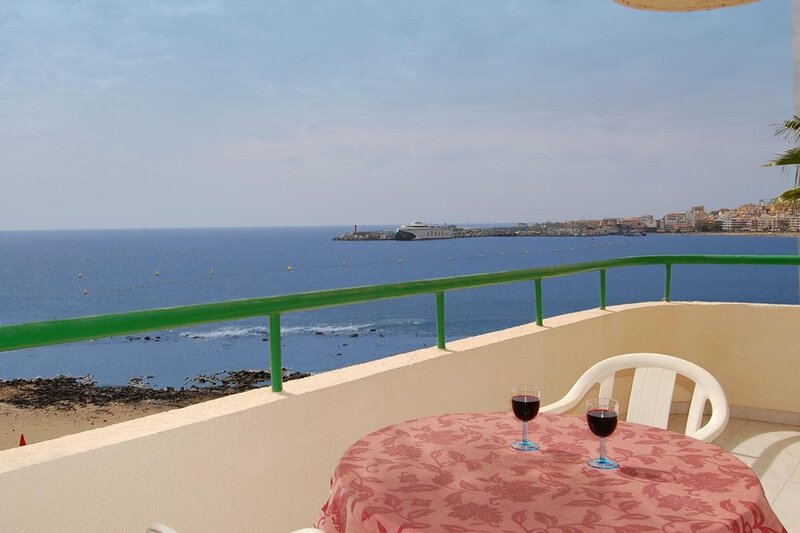 With wonderful sea front views, a lovely communal pool and a large sunny terrace, the apartment offers all the ingredients for a lovely Los Cristianos holiday. The living room is very comfortably furnished with 2 x sofas (1 is a sofa bed) and table with 4 dining chairs. From here patio doors open to the large sunny terrace. In one direction the terrace overlooks the pool. In the other you have glorious views over the beach to the sea. The bedroom has a double bed and fitted wardrobes. There is satellite TV provided through the communal dish. Air conditioning is provided in the living room. There is a washing machine at the property. The communal pool is for the exclusive use of those staying in Costamar and has plenty of sun beds. Costamar is one of the most established complexes in Los Cristianos. Overlooking Los Cristianos Harbour, it offers a 24-hour reception, a lounge bar, private parking and free wi-fi in communal areas. Being in the ideal location you are just 500 metres from the resort centre with its restaurants, shops and bars. With this apatment you combine the comfort of a very well looked after privately owned apartment with the benefits of a well sought after holiday complex. The on site bar has wifi.